The last thing I want to do after making a really awesome meal is clean the dishes, so when I moved to cast iron pans I had a really steep learning curve with how to care for them. It has been 4 months and 75% of the time I forget the pans in the sink overnight and wake up to a rusty mess. 15% of the time I clean them the wrong way, but hey 10% of the time I get it right! I have read several great posts about cast iron care but most gloss over how to un-fuckup your pans. And if your pans look like mine, you will need all the help you can get. Pretty much every single time I make a big meal I have an almost full dishwasher and too many dirty dishes to put into it, so I place those remaining in the sink and wait until the dishwasher is done to reload. Piling dishes into the sink can be a hard habit to break when you have cast iron pans. Your pans will rust when left in water for too long, so while it may seem like a good idea to soak them it is actually very counter productive. Start by scouring the pan with a tiny bit of water. Using your muscles can go a long way. But if you muscles don't work full then you should resort to salt. Yep salt. Pour a tablespoon full of large grain salt into the pan and keep scouring. Await the miracle to happen before your eyes. 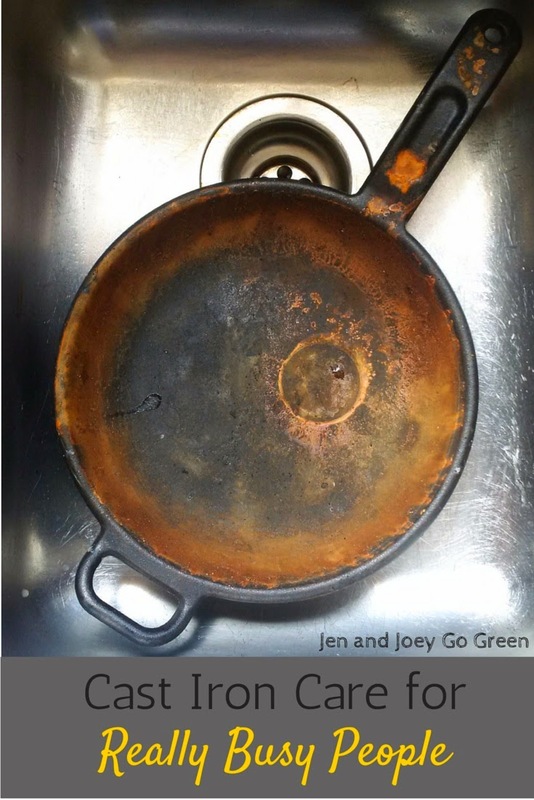 Once you have removed all the rust, rinse and DO NOT LEAVE THE PAN IN THE SINK AGAIN. The next time you use the pan if you find that it is sticking then you may need to re-season the pan. If you have tried scrubbing food off of your pan and it won't come off, or if you want to try anything other than scrubbing the easiest way to clean it is to heat water in it. The stuck on food will just melt away within a few minutes. Place your pan on the stove - or just don't remove it from there in the first place. Add enough water to cover the food. Simmer on medium low for 5 minutes, stirring every few minutes with the wooden spoon. Remove the pan from the stove and pour the water/food into the sink. Give it a quick scrub and run water over the entire pan. Dry the pan immediately and rub the entire thing with a thin layer of coconut oil. Sometimes no amount of elbow grease will remove stuck on food but maybe you don't have enough time to simmer water on the stove. A quick shortcut is to add salt to the pan and quickly scrub it with a scouring pad. Then as always, rinse, dry and apply a thin layer of coconut oil. 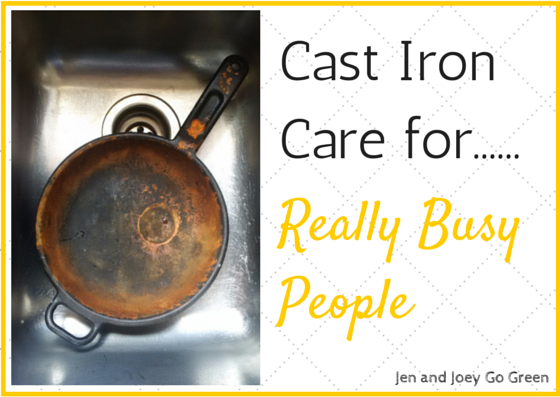 Do you have cast iron pans? What is your best trick for cleaning them? There are Affiliate links in this post that when used help to pay for this blog. These are great tips. I use salt even with stainless steel. I wonder how crushed eggs would do? That is a good idea to use salt on stainless steel! I needed this post I have a cast iron pan the looks a little like the picture and I was not sure what to do with it, how to get it back, and how to keep it from looking like that again! I am seriously the worst at remembering to not just leave mine sitting around. I had cleaned another one and left it sitting to dry while I did something else. Totally forgot about it so when I came downstairs the next day there was a huge line of rust where water had accumulated. UGH. Jen, I don't have any cast iron yet but I am terrible at washing my pans. I always leave them in the sink until the morning with the hopes someone else may do them :) I'm saving your tips because when I get one, I will need them!